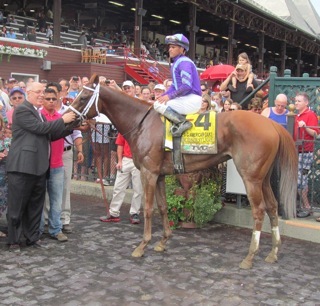 After winning the Coaching Club American Oaks (G1), Princess of Sylmar is fast becoming the people’s horse. 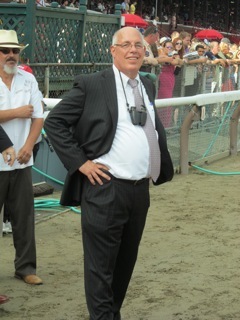 Principle owner, Ed Stanco of the King of Prussia Stable brought over 100 friends and family to Saratoga for her eighth career start. The cheering began in the paddock when Princess was being saddled and continued as she walked out to the track with jockey Javier Castellano aboard. The shouts of “Princess!” could be heard throughout the track. As expected My Happy Face took the lead right out of the gate and set the early steady and moderate fractions of :24.60, :48.98, and :1:12.24. Cue the Moon and Marathon Lady, who each had only a maiden victory to their credit, tried to stay close to the Princess. Coming down the stretch she easily passed My Happy Face and extended her lead to the final margin of six lengths as My Happy Face held on for second. The victory gave Todd Pletcher his fifth win in the CCA Oaks. His previous four winners were: Devil May Care 2010, Octave 2007, Ashado 2004, and Tweedside 2001. Stanco described the victory, “We won this little race on a Saturday afternoon at this little country track called Saratoga and what a great thing, what a great thing." The win in the CCA Oaks gives Princess of Sylmar her second grade one stake victory of the year along with the Kentucky Oaks. 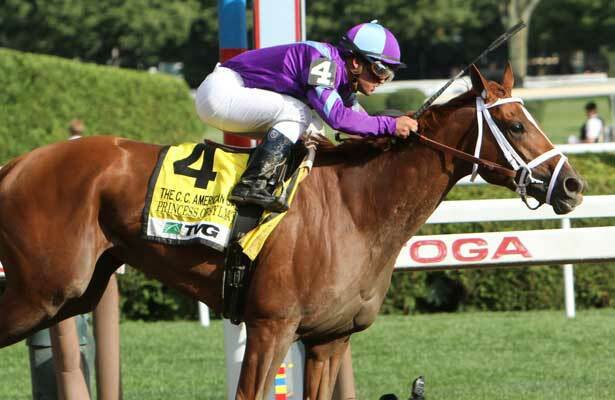 The 2013 running of the Kentucky Oaks was considered to be one of the strongest fields in many years. These two wins clearly put Princess at the top of the three year-old filly division. finish up in the Cotillion?! PLEASE tell me they are sending her to the Ladies' Classic. Princess got a 104 BSF, which is only the third time a 3YO has cracked the 100 level. Dreaming of Julia had the 114 at GP and Close Hatches had a 101 in the Mother Goose. Stanco meant finish up Breeders' Cup preparation! She was brilliant today, hopefully it puts an end to some of the nay sayers.